This year’s Spring Meetings of the Boards of Governors of the International Monetary Fund (IMF) and World Bank Group were full of thought-provoking discussions on emerging challenges and opportunities facing the African continent. I especially found that the conversation during The State of the Africa Region, the meetings’ premier event on Africa, particularly captured the key trends shaping the continent’s economic landscape. Interviewed by CNBC Africa Senior Anchor Gugulethu Mfuphi, Dr. Albert Zeufack, chief economist for Africa at the World Bank Group, eloquently presented the Bank’s most recent findings on African economies. Below are what I found to be the most insightful comments and ideas I heard throughout the week, which world-renowned economist Zeufack also emphasized during the event. These points, shared with the governors of central banks, ministers of finance and development, parliamentarians, private sector executives, representatives from civil society organizations, and academics, I think accurately reflect and anticipate the economic future of the continent. 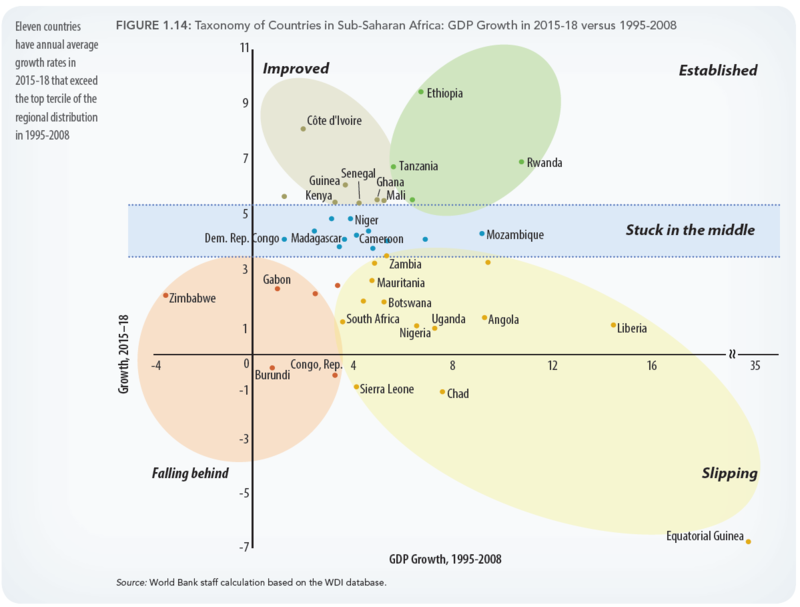 Regional trends: Sub-Saharan Africa’s growth overall is rebounding and likely to be sustained, but only given certain conditions. West and East Africa are leading the way, but Central Africa is struggling. Angola and South Africa are undergoing positive economic transitions. After a slowdown in recent years, growth is returning to Africa (with projections of 3.1 percent growth in 2018, and 3.6 percent in 2019-20). The regression has stopped and, for the first time since 2016, per capita GDP growth has been positive. Moreover, as illustrated in Figure 1.14 from that report, East and West Africa’s growth prospects have strengthened and are leading Africa in and to higher growth. For example, Ethiopia, Rwanda, and Tanzania (East Africa) are growing at over 6 percent. Senegal and Côte d’Ivoire, and Ghana and Guinea to a certain extent, are powering through growth with improved performance as well. Despite this optimism, there are reasons to be cautious. These positive growth trends are based on two assumptions that are not guaranteed: First, commodity prices will rise or remain stable. Second, African countries will accelerate and deepen macroeconomic and structural reforms. Additionally, despite the positive and relieving trends, the continent is still not growing fast enough and is still far from pre-crisis levels. Governments should therefore continue deep macroeconomic and structural reforms. For example, the CEMAC region (Central African Economic and Monetary Community) needs deeper structural reforms and smart fiscal adjustments. Countries should therefore keep strengthening their reforms to achieve success. Source: World Bank. Africa’s Pulse, No. 17, April 2018. Debt is obviously rising, but the most concerning trend is the change in debt composition, which brings market-led risks that countries are not well equipped to manage. The situation may also be aggravated by investment inefficiency. In fact, the number of countries at high risk of debt distress has doubled since 2013, now standing at 18. The question of debt sustainability has returned as an issue of concern for the continent and was prominent throughout the Spring Meetings. Debt has been continuously rising, with the average debt-to-GDP ratio increasing by 15 percentage points from 2010 to 2017. Some countries’ debt-to-GDP ratios have multiplied by five during the same period. 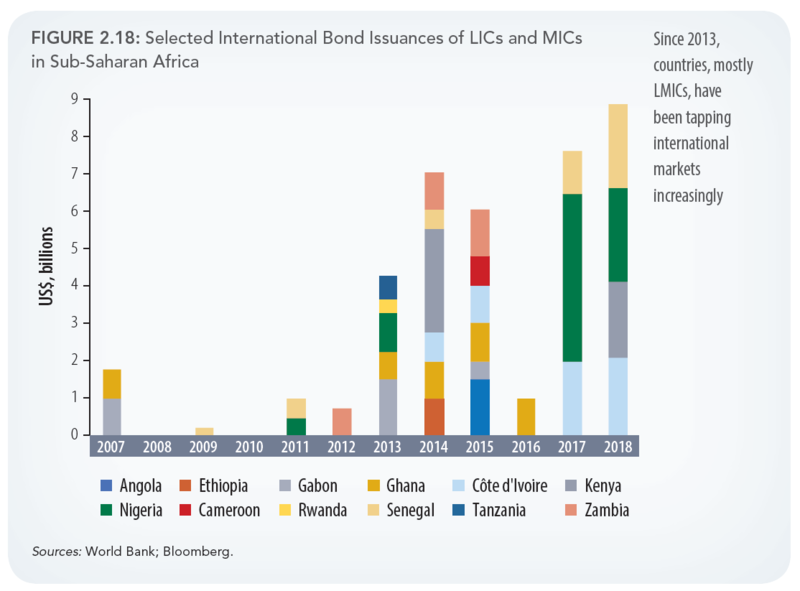 In the first quarter of 2018, eurobond issuance exceeded Africa’s 2017 year-end amount (Figure 2.18). More notably, debt composition has also been changing extremely fast, as countries are moving toward short-term maturities and market-led debts, and away from concessions and long-term financing. This situation exposes African countries to new type of risks, very complex market-led risks that countries are “not well-equipped to manage,” according to Zeufack. 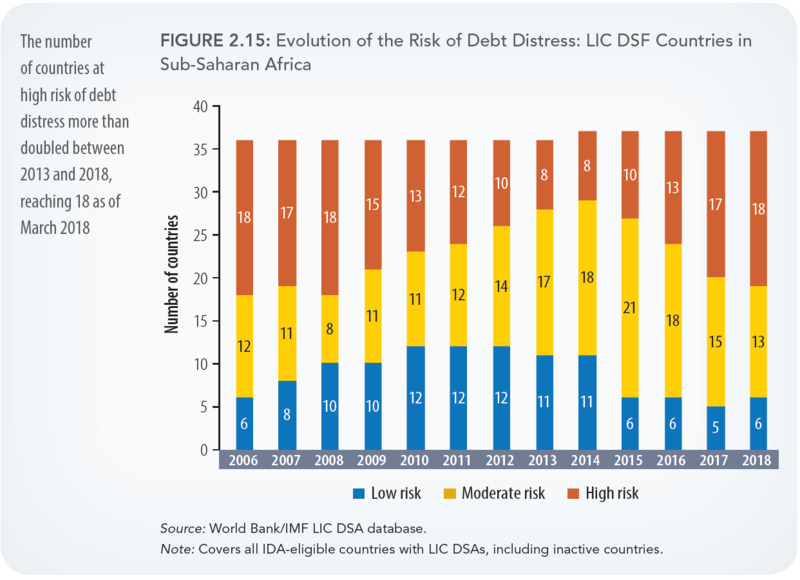 It is uncertain if Africa will be able to service the debt (especially since the maturities are mismatched in tightening fiscal spaces). Also worrying is the fact that countries are not necessarily using this debt efficiently. On the contrary, moderate borrowers (with a 10- to 20-point increase of average public borrowing debt between 2012 and 2017) are mostly borrowing for consumption instead of investing. If heavy borrowers (with more than a 20-point increase of average public borrowing debt between 2012 and 2017) are investing, they are not doing so efficiently. These factors are lowering growth in many of these countries. Moving forward, countries should develop the appropriate fiscal space and domestic resource mobilization to service debt, increase investment efficiency, rethink infrastructure financing, and fully embrace innovation in order to leverage disruptive technologies to boost productivity, especially in the agriculture and energy sectors. I was pleased that much of the conversation at the event focused on solutions to many of these challenges. In fact, Zeufack stressed the importance of accelerating and deepening reforms to strengthen the growth momentum. First, proper fiscal space should be created to appropriately service debt, with a substantial increase in domestic resource mobilization. Countries should wisely collect and spend their own funds on the public goods and services they need. Second, countries should adopt reforms aiming to increase the efficiency of investments, from project selection to successful delivery. Increasing efficiency will provide additional resources for macroeconomic stability and debt sustainability. Third, infrastructure financing should be more meticulously designed and implemented by African countries to avoid bad deals that substantially increase debts without delivering sufficient quality infrastructure. Finally, countries have to fully embrace innovation, and harness, scale up, and leverage technologies to boost productivity across and within sectors, especially in agriculture and energy. As was evident throughout the Spring Meetings, leading economists like Zeufack and Makhtar Diop consider bridging different sectors to achieve macroeconomic and structural transformation and bring big data, artificial intelligence, education, and a strong endogenous private sector to help accelerate the much-needed development of efficient productive sectors to be absolutely critical for Africa’s success. Given the tremendous economic potential of Africa, it is critical, when implementing these reforms, to ensure that Africa’s fast economic growth leaves less, not more, poor people behind contrary to what happened in the past decades. Some of the challenges and solutions presented here are further discussed in my book released by Cambridge University Press, Innovating Development Strategies in Africa: The Role of International, Regional, and National Actors, as well as in some shorter publications on infrastructure (including energy), agriculture, policy implementation, and the potential impact of the African Continental Free Trade Area. As beautifully said by Mfuphi during the April 21 event, “The music is back on; the party hasn’t yet started.” In other words, the return of growth is encouraging, but much more needs to be done to accelerate the growth momentum and scope, and broaden its benefits so that no one is left behind.